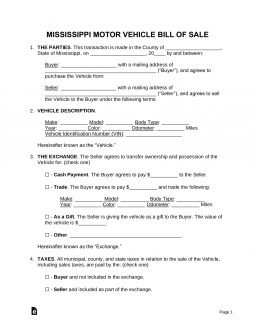 The Mississippi Bill of Sale Forms are considered legal documents that will establish proof of sale for any type of vehicle, boat/vessel, or any number of items for sale by a dealership or individual. These documents will also prove a change of ownership and will provide various articles of required information. Some documents require notarization. Boat Bill of Sale – This form would be used for the sale and purchase of a vessel and will establish a change of ownership. General Bill of Sale – This document is most usually generated between two private parties for the sale, purchase, and change of ownership with regard to personal items. Gun Bill of Sale – This would be used to provide legal proof that a firearm has been sold and purchased, therefore proving a change of possession. Vehicle Bill of Sale – This form is to be used to show proof that a vehicle has been legally sold and purchased. Also establishes a change of ownership and is often a necessary document needed for registration. You must have completed a Mississippi Motor Boat Registration Application – Should you be unable to download and print one for any reason, you may acquire this application from a county tax collector’s office, a Mississippi Department of Wildlife, Fisheries, and Parks office, or nearly any vessel/boat dealership.